This is an entree chicken salad developed while I was experimenting with new cooking techniques, particularly sous vide cooking. Sous vide is a cooking method which means “under vacuum”. Essentially, you place the food in a sealed vacuum bag and cook it in a low heat water bath for longer periods of time. It leaves the meat moist and flavorful and you don’t have to heat up an oven or grill to do it. 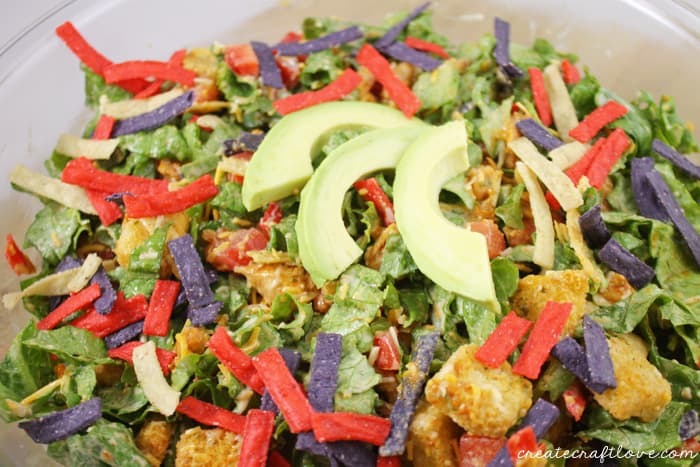 You will love the bold flavors in this Southwest Chicken Caesar Salad! To cook sous vide you will need a stock pot, a 1 quart zip up plastic bag, and a reliable cooking thermometer. You will need to be pretty precise with your temperature. Fill a stock pot with water and heat it to 149° F. Place the diced chicken into a 1 quart plastic bag. Add 1-2 tsp olive oil, and the package of taco seasoning. Mix lightly. Place the bag into the water making sure to remove bubbles and seal the bag creating a bit of a vacuum. No water should be allowed into the bag. Reduce the heat so that the temperature of the water falls to 144°F. Maintain the water temperature at 144°F and cook the chicken for 1 hour (see note on food safety). While that is cooking chop up your lettuce, green onion, bell pepper, and anaheim pepper and put them in a serving bowl. Add shredded cheese, tortilla strips, and croutons. When the chicken is finished add it to the salad. Add your lime and caesar dressing and toss well. 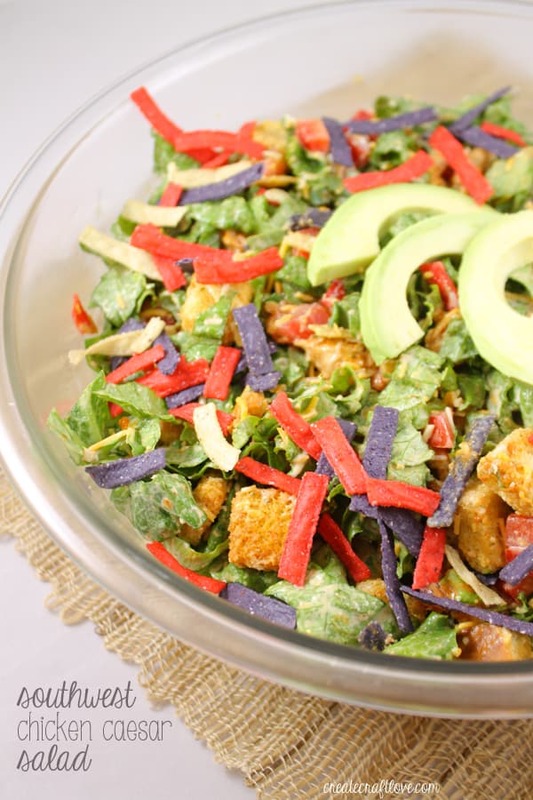 The spices from the chicken will mix with the dressing adding the southwest flair to the recipe. Garnish with fresh cilantro and/or avocado slices. * A note on food safety – Some of you may balk at cooking chicken in this fashion since the FDA recommends a final temperature of 165°F. This number however is designed for more typical high heat cooking methods like a grill or oven. The goal is essentially to pasteurize the chicken, and pasteurization is based on temperature and exposure time. For example, in order to meet FDA standards for pasteurization, most milk these days is pasteurized using the high-temperature short-time (HTST) method, which heats the milk to 165° for 30 seconds. However, small “microbrew”-type dairies may not have access to flash pasteurization and they meet FDA legal standards by heating the milk to 145° for 30 minutes. Cooking sous-vide uses lower temperatures for longer times to maintain food safety. We have been using this method in our house for about 3 years and have had no issues with it. Given the amount of salmonella and listeria outbreaks related to produce over the last few years, the lettuce in this recipe presents more of a risk than sous-vide chicken.